Pages on the calender whiz by and in the blink of any eye it is suddenly mid-September, when farmer’s markets and produce stands overflow with fresh picked corn, squash, melons, green beans, peaches, apples and more. No question, this seasonal flutter of abundance also means it is canning time in many local kitchens. Browsing my local farm stand, I recently spotted an unfamiliar specimen tucked among a colorful display of assorted cherry tomatoes: pint baskets filled with peculiar tiny paper lantern shaped packages. What is that?? Why, it’s another culinary distraction! Erin, one of the staff regulars, smiles, offers a sample, and explains they are an heirloom variety affectionately called ground cherries. Wrapped inside each festive papery covering lurks the most extraordinary baby tomato―asweet, succulent, golden bundle bursting with tropical pineapple overtones. The ground cherry gets its name from the fact that it falls from the vine onto the ground when it is ripe. Some may be familiar with its larger cousin, the tomatillo, also known for its papery wrap. Like particular members of the nightshade or Solanaceae family including some tomatoes and potatoes, the ground cherry contains solanine glycoalkloids, a toxic chemical (extremely bitter tasting) when eaten immaturely green and raw. 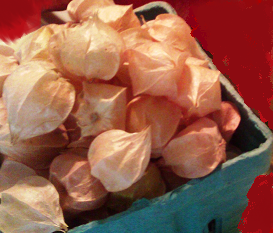 Most likely, the ground cherry made its way to the U.S. from Latin American as early as the 1700’s. The plant is so adaptable it even grows wild along roadsides on the east coast from as far south as Florida and into New England, where it is often known as the Cape gooseberry. These heirloom beauties are perfect for the home gardener: they are fairly disease and pest tolerant, plus they conveniently fall onto the ground when ready for picking. How easy is that? 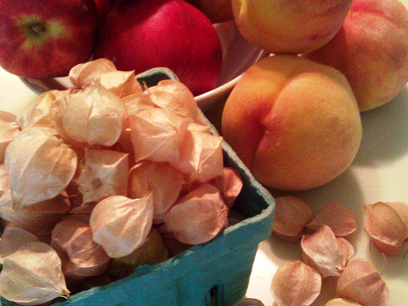 Allow the ground cherries to ripen a bit more by storing at room temperature in the husk for about a week. When their color has turned to shades ranging from yellow to apricot they are ready to eat, prepared as you would any other tomato. The resourceful and enterprising Pennsylvania Dutch, particularly fond of them, have long included ground cherries in cobblers and pies, and even pickle them. 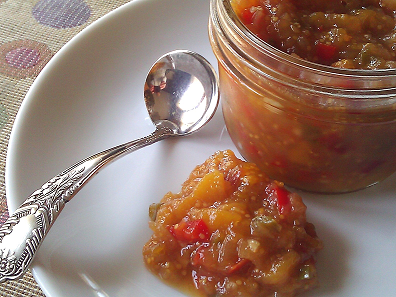 For a test run, I’m thinking the condiment idea makes sense―a chutney of some sort would enhance the ground cherry’s tropical qualities. Since, I only have one small basket I decide to combine these charmers with a few peaches plus a couple of apples for texture. I let the chutney reduce down before adding the whole ground cherries, then realize they would have cooked quicker if halved first. Oops. I patiently watch, waiting for them to burst; exasperated, I finally start breaking them up with a wooden spoon to release their juices. Still under 40 minutes, the mixture burbles and thickens and the tomato seeds become more apparent, which further add to the novelty. 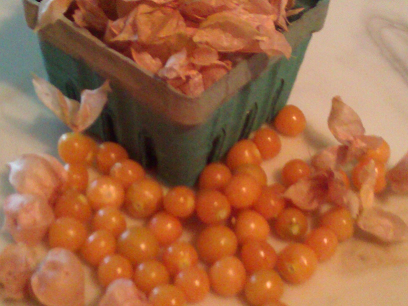 Yes, I like the ground cherries’ identifiable shape and and am very pleased that I kept them whole. The taste test: a mellow sweet/sour/spicy/salty blend of fruits and vegetables all arced with a hit of heat. A good curry condiment for sure. But, call me crazy, I’d even put this on ice cream. I’m thinking ground cherries are certainly worth considering for next year’s garden under the category of Easy and Versatile. In a heavy saucepan, combine all but the ground cherries and bring to a boil. Simmer approximately 20 minutes, until much of the liquid has cooked out. 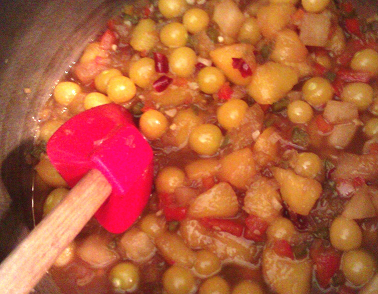 Add the ground cherries and boil lightly approximately 20 minutes longer; until the cherries pop to reduce liquid and the chutney has thickened. Cool and store in the refrigerator. Makes 2 cups. Next: Next post: Found Food: Ground Apples. Really?